Click to watch video Let's bike! Exercise options should be available everywhere and motivate people, whenever there is a spare moment in our busy inactive everyday life. The new KOMPAN bike is made to fit anywhere in the outdoors, inspire people to get started, and give a motivating workout that makes people come back for more. There are no more excuses - get started, burn calories, have fun and be healthy. Cycling is one of the most popular cardiovascular exercises. It is simple, highly effective and at the same time safe. A bike workout offers low impact on the joints and with a stationary bike, user balance is also supported. The KOMPAN fitness bike combines a durable design with features known from professional indoor exercise bikes. This way, it works in both unsupervised public spaces and in dedicated outdoor sports areas. 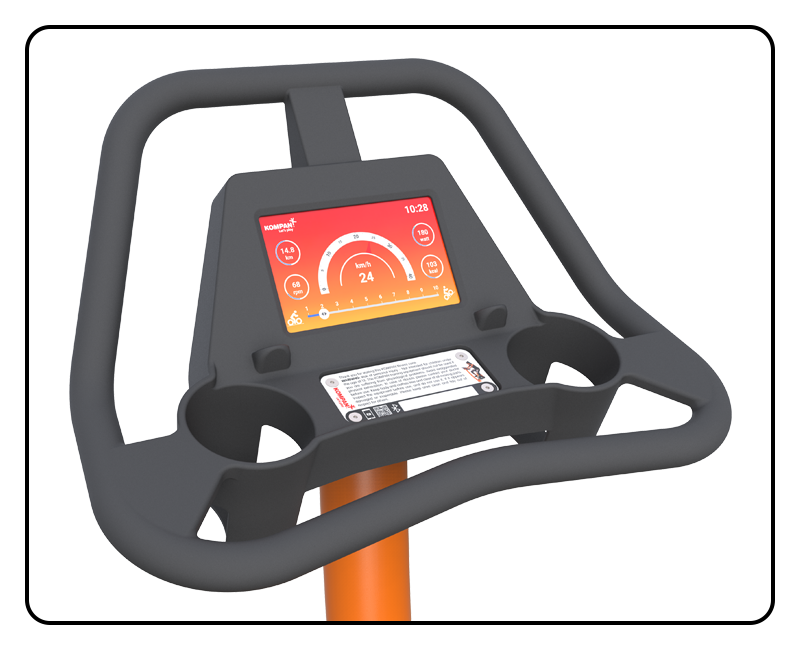 Users can adjust saddle height and cycling resistance to match their personal posture and fitness level. And for the first time ever, on an outdoor fitness bike, it is possible to track workout power, cadence, and calories, allowing users to improve their performance and reach their personal goals. An outdoor cycling class is an actual option now – are you ready to join? Choose either a City Bike with comfortable upright riding style and low entry design or go with a Sport Bike promoting a more forward-leaning riding style. With an innovative Automatic-Drive-feature, the bike adapts resistance intelligently depending on pedalling speed - Easy for beginners and hard for the experienced. Designed with multiple hand positions to accommodate different riding styles. Room for optional screen, two bottle holders, phone and tablet holder are incorporated. 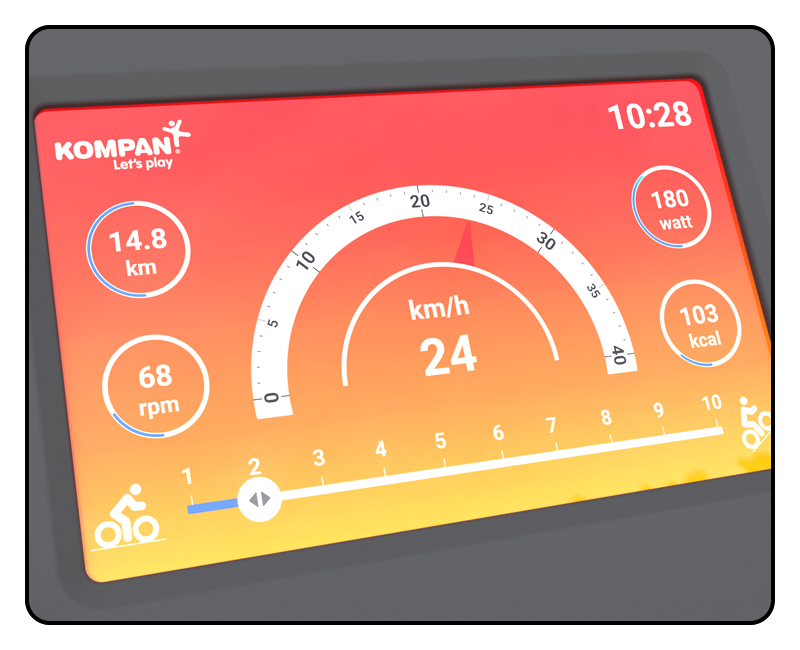 7” LCD colour touchscreen made of vandalism-proof protection glass, gives instant feedback on speed, distance, cadence, watts and burned calories. Motivation is the key to succeed in reaching your exercise goals. 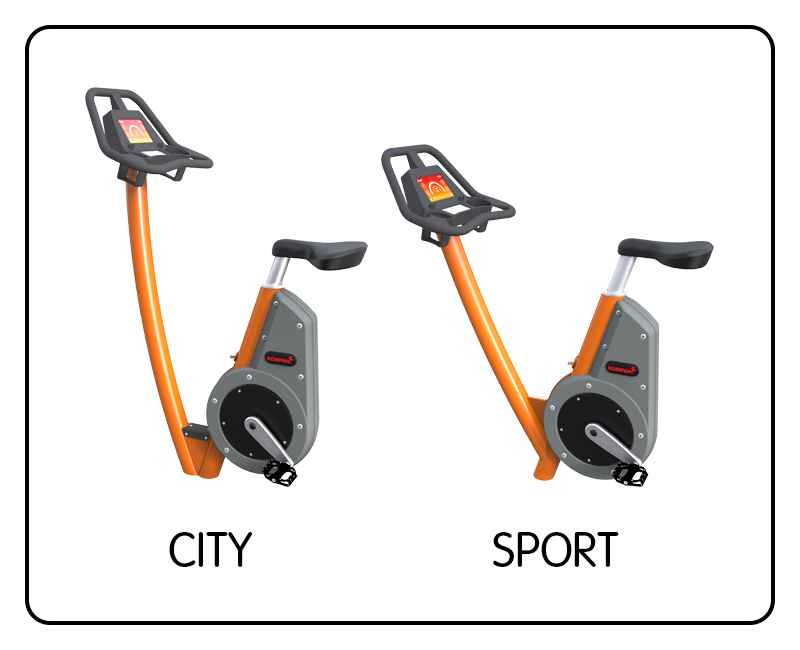 Working out should be fun, and that is why the KOMPAN bike is not just about turning the wheel. The optional screen sparks the experience by giving users output on their performance, but also bikes without screen has this option. The KOMPAN Cardio app offers the same functionality as the screen and much more. With the app, users can connect through Bluetooth, get access to instructional and motivational videos, store their activity and share to external platforms, such as Strava, Apple Health and Google Fit. It furthermore connects to apps such as Vescape and Zwift, where users can gamify the biking experience, ride virtual roads, and compete against cyclist around the world. With the connected biking experience, users can come back for something new every week. The KOMPAN Cardio app is available in App Store and Google Play from April 1st. A higher level of fitness is associated with a better chance for a long healthy life with a high functional capacity – not just physically, but also mentally. In the case of diseases, aerobic exercise is one of the most effective things that can be done to reduce symptoms or reverse pathology. Aerobic exercise can be done in a time-efficient and motivating fashion, when performed on exercise equipment that supports adequate intensity options, such as the KOMPAN Fitness Bike. On society level, investments that improve population fitness are highly cost-effective. The bike is intelligent, so if you are in poor shape, unaccustomed to exercise, you can come and use it, and it will provide exactly the workload that you need. If you come to the bike as an athlete, the bike will adapt to your profile, and you can get a high-end, high-intensity sport experience. The bike is designed and made to last in the outdoor environment, which can be hostile because of bad weather conditions and potential vandalism. High quality materials are chosen for all details from handle bar to pedal arm to ensure the bike stays nice, even after heavy use in unsupervised public spaces. Two different installation options are available, surface mount and inground installation, and with these you can install it anywhere. There are no surfacing requirements to the space and with a self-powered design, no electricity is needed either. 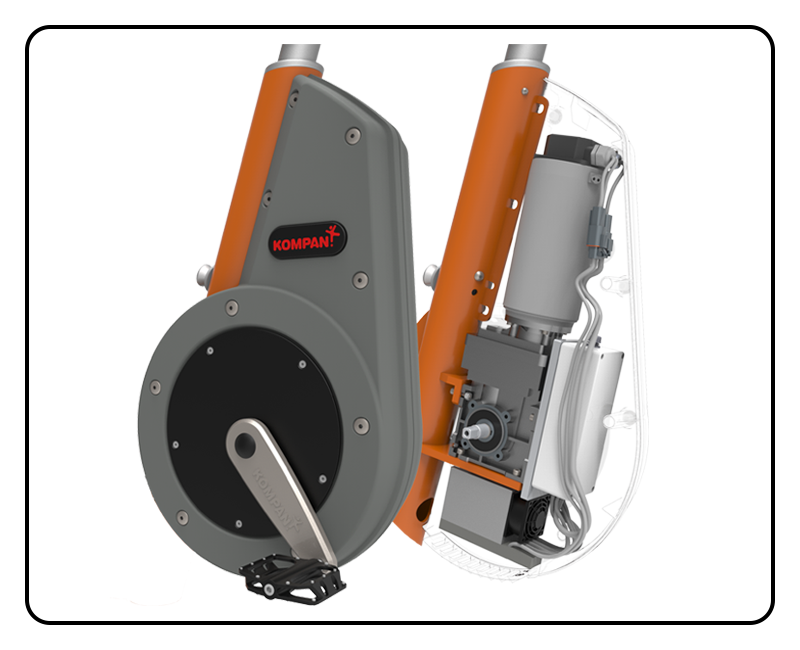 The bike is certified by TÜV SÜD according to EN 16630 and complies with ASTM F3101. In addition, the bike is certified by UL according to UL 1647 and CSA C22.2 No. 68. Watch the video for a technical run-through of the bike.